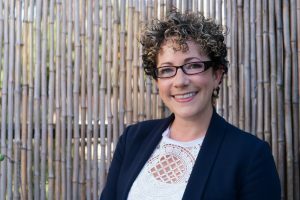 Nicole Perlman has written for Fox 2000, Universal Studios, Disney, Cirque Du Soleil Films, Dreamworks, 20th Century Fox, and Legendary Studios. She has worked on several Marvel Studios films, including Captain Marvel (slated for a 2019 release) and the 2014 blockbuster Guardians of the Galaxy, which won a Nebula Award and a Hugo Award. Her first comic book series, Gamora, debuted this year for Marvel Comics, and she is currently writing a science-fiction television pilot for Amazon Studios. In her free time, Nicole serves as a mentor at the Sundance Screenwriters Labs, and is celebrating her fifth consecutive year of being on the steering committee for the National Academy of Sciences’ The Science & Entertainment Exchange, a nonprofit organization that aims to bridge the gap between scientists and filmmakers. Tell us about your background! How did you get into movie production? What inspires you? I originally had dreamed of being a playwright, so I went to NYU’s Tisch School of the Arts for my undergrad degree, double majoring in Dramatic Writing and Film/TV Production. I ended up doing more screenwriting than playwriting because I found myself drawn to telling stories visually. I got my foot in the door with a screenplay that won the Sloan Grant for Science in Film, about a Nobel Prize–winning physicist. On one hand I tend to be inspired by stories about obsessive people, worlds we do not know much about, secret histories, and bold female characters. I also enjoy explosions and aliens and heists. So, there is a lot to be inspired by! How did you become involved with The Exchange, and what have you enjoyed most about working with the program? I became involved after getting an invitation in 2012 to join an Air Force media trip being coordinated by The Exchange. We flew to Lackland Air Force Base in Texas on a C-17 and had an incredible experience getting to spend time with the Airmen there. I made a lot of close friends from that trip, including Rick Loverd. who eventually invited me to join The Exchange’s steering committee in order to help shape the program’s direction going forward. The Exchange is my favorite extracurricular activity and tends to be where I meet the most thoughtful and lovely Hollywood people. Glamorous geeks, all of them. Were there any films or television shows that sparked your interest in science when you were growing up? What were your favorites? What shows do you watch now? I watched Star Trek: The Next Generation religiously growing up. Contact and Gattaca were two of my favorite films—and continue to be. My favorite shows I am watching now are The Handmaid’s Tale, Black Mirror, and of course Rick and Morty, which is hilarious and brilliant in the way it handles multi-dimensional storytelling. Is there a storyline you would like to see in a television show or movie that involves any of your scientific interests that has not yet been covered? I am a little bit obsessed with CRISPR-Cas9 and the implications of what happens when we start messing around with the human gene pool. Maybe we will cure cancer or maybe we will end the world? Who knows? That is the fun part! I know some shows (like Luke Cage) already allude to CRISPR, so perhaps a better answer is that I would love to see a digital-to-biological converter in a grounded science-fiction show or film soon. Maybe printing DNA/viruses/vaccines/synthetic bacteria is already in a show I do not know about, but it is a fascinating device and extremely cutting edge. In general, what misperceptions do scientists have about the entertainment industry, and what misperceptions do you think the entertainment industry has about scientists? I think scientists and filmmakers do not often realize what good creative partners they can be to each other. Some scientists think the entertainment industry is not interested in their creative ideas, and I think the entertainment industry does not realize that plenty of scientists love movies and would be happy to help brainstorm creative solutions to plot problems. Just because you may have a story point that is not grounded at all in science does not mean the scientist will necessarily blow up your story. He or she may point out, “well that doesn’t make sense, but here’s a more interesting alternative idea of something that could actually happen, given the direction the field is going in.” Those kinds of conversations are the best. How important is it that the audience sees science portrayed accurately in film and television, and how can we encourage other scientists to serve as consultants to the entertainment industry? I think representation is extremely important in film and television, and the way scientists are portrayed is a big part of that. Seeing women and people of color in lab coats is not only more interesting but also more accurate. I think audiences are tired of the clichés of “mad scientist” or “pale, socially awkward scientist,” which by this point is such a trope it is just lazy writing. Most of the scientists I know are fantastically interesting, unique, and passionate people. That makes for better characters on film and hopefully stokes an interest in the audience in pursuing a career where they can just be the best version of themselves. I think if scientists realize that their unique life experiences in science are just as useful to building a character as their fact-checking abilities, they would be more open to participating in a dialogue with writers and filmmakers.